In the moment we reproduce 3 large Bernhard Bloch gnomes, created approx. 1880 in Eichwald Bohemia, which is now part of Czech Republic near the German border. We will have soon the molds of another large lying gnome, of which we do not know the manufactor. Then we have a reproduction of a very small and charming Bernhard Bloch gnome and a small Johann Maresch. New this year is a gnome with a little pig, manufactured with the original mother molds - more than 100 years old. 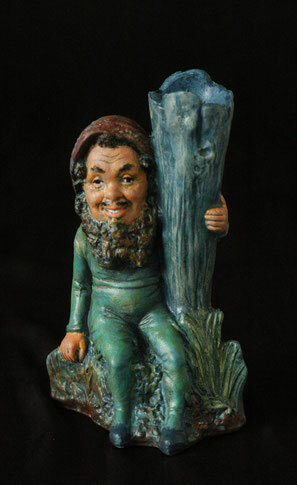 Original the 43 cm gnome was in a series of butcher gnomes, modelled for Eckhardt & Menz in Graefenroda, Thueringen and later produced by Griebel. And we run tests with another 60 cm Griebel gnome, created approx. 1910. 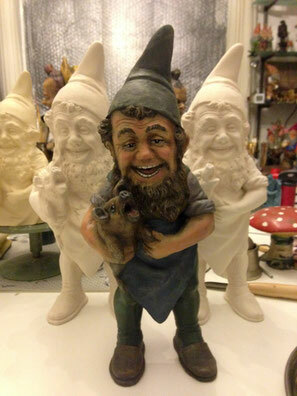 All gnomes have an individual paint, so each gnome is unique figure. Charming tiny Bernhard Bloch gnome with a small vase was our second ceramic gnome, that we reproduce in a small series. Every figure is handpainted and different. Can be used for flowers, pens and brushes.